Snapguide is a beautiful way to create, share, and find how-to guides, recipes, and other instructionals — straight from your iPhone. 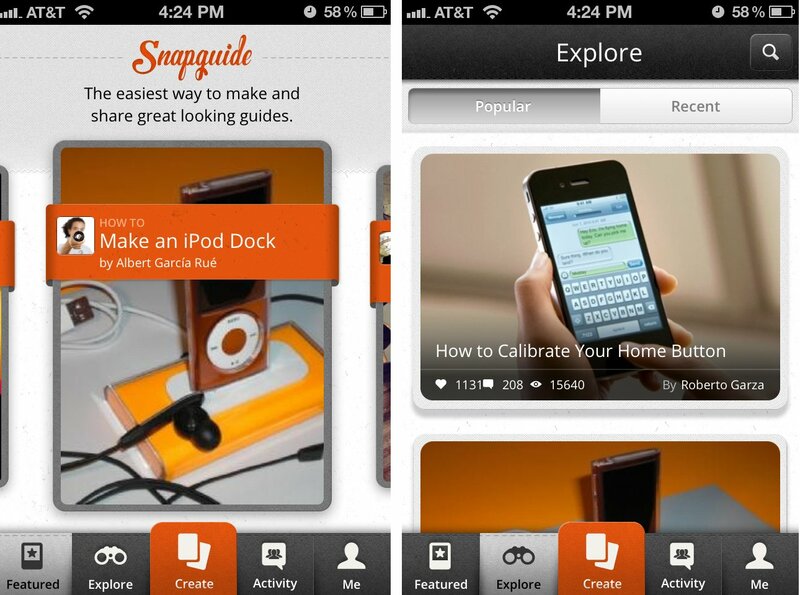 Snapguide for iPhone allows you to create instructional guides (including recipes) straight on your iPhone, complete with pictures, videos, and captions. When you're done you can publish your guides and share them via Twitter, Facebook, or email, as well as with the Snapguide community. When you first open Snapguide, you'll be walked through a quick tutorial and then you'll be able to create an account. Once you've finished the quick sign-up process you can get to creating guides. Most users will probably want to spend most of their time viewing existing guides created by others. After you register you'll be able to do exactly that. Just use explore the tabs along the bottom to view all kinds of guides. You can also use the search feature in the upper right hand corner in order to search for a specific guide you may want to view. 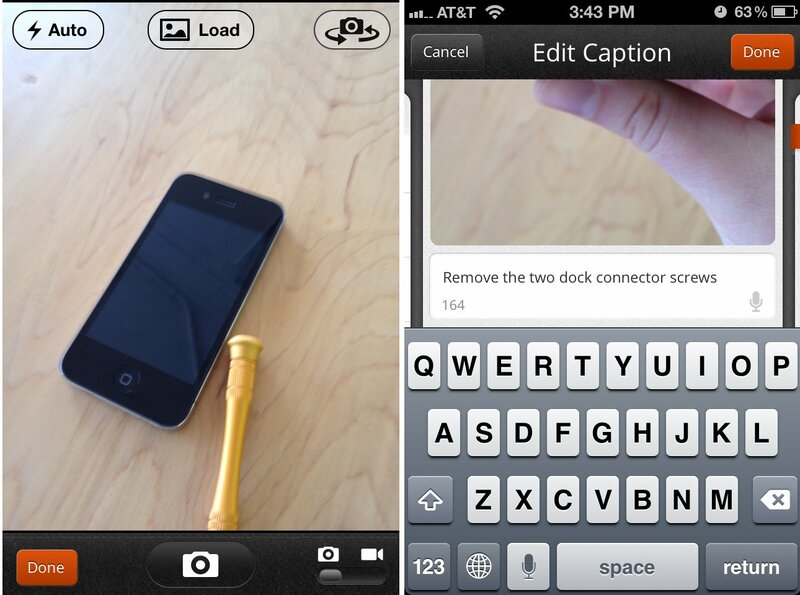 Once you've started to create a guide you can choose between photos, video, or text. 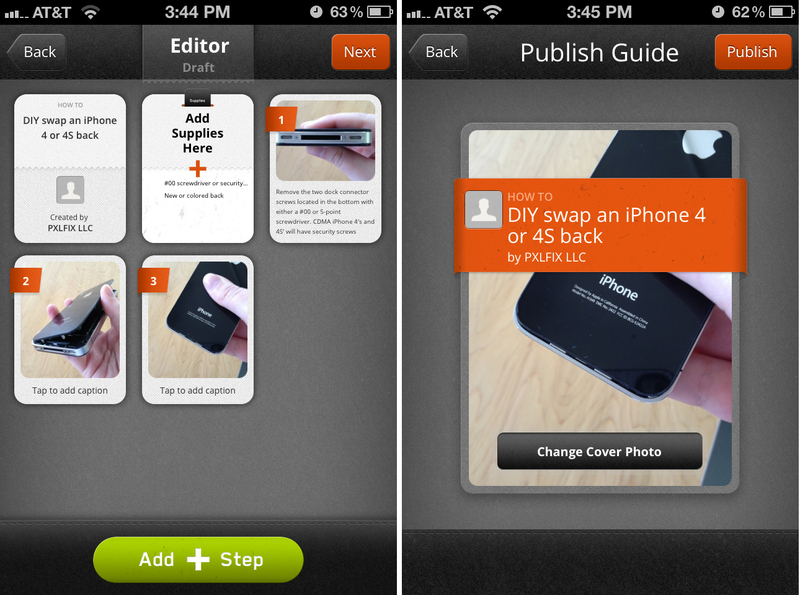 Snap a picture or take a video of the first step to insert them into your guide. If you've got a bunch of images or video to shoot, just take them all in one go if you'd like and then go in and edit the steps afterwards. 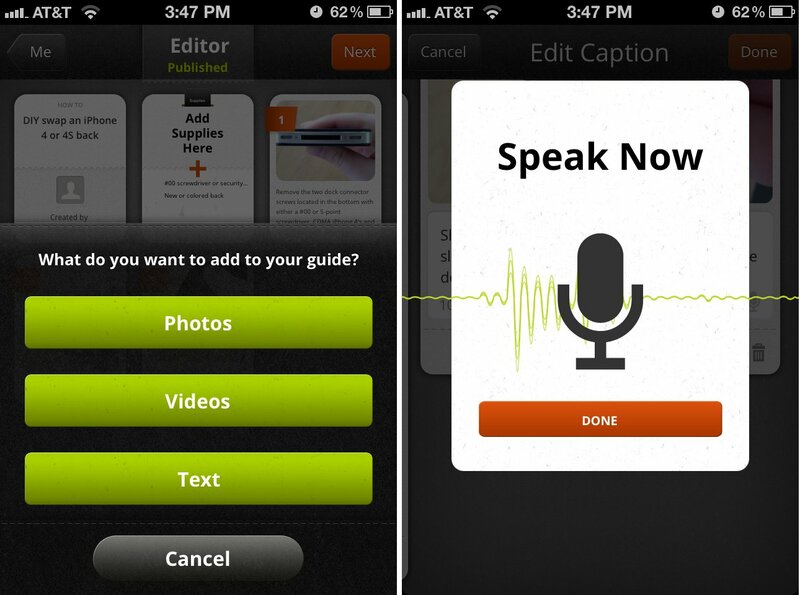 Snapguide also has Dictation integration so if you're explaining a particularly lengthy step and have an iPhone 4S you can enjoy adding captions to your steps by speaking them. Once you've got your guide exactly the way you want it, you can publish it with a single tap. From there it'll be shared with the Snapguide community and other users can comment on it or follow you in order to see all your guides. You can also choose to email the guide to someone, share it to Facebook, or tweet it out. You'll have to authorize Facebook but Twitter will just pull from your native Twitter accounts (you can choose which account you'd like to tweet it from if you've got more than one). You can also copy the link to share on other sites as too. If you figure out later on that you forgot a step or want to word something different, no worries. Just open up your profile and tap on the blue pencil next to the guide you want to change to edit it. Tap into the guide without clicking the blue pencil in order to view how many users have liked it or to share it again. Snapguide is a beautiful way to create, share, and find how-to guides, recipes, and other instructionals -- straight from your iPhone. 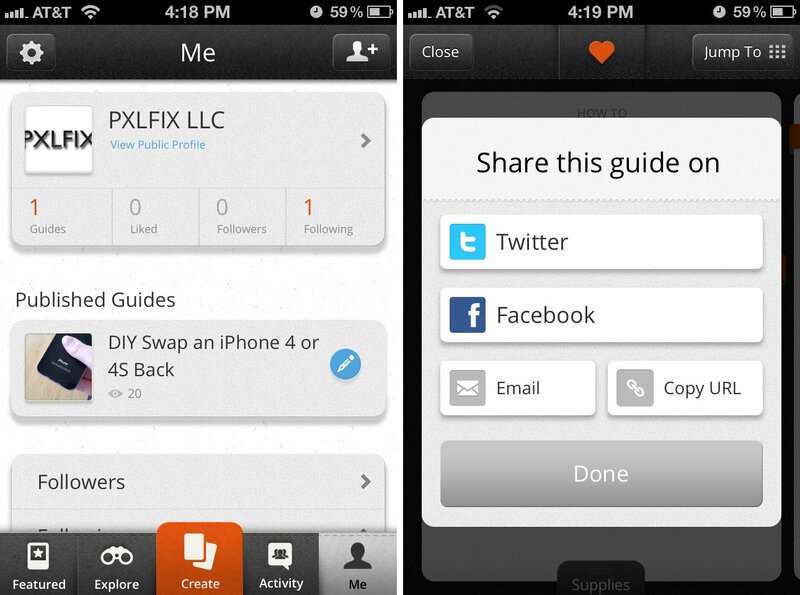 I've yet to find an app that's as intuitive or easy to use as this one for creating or viewing DIY guides. 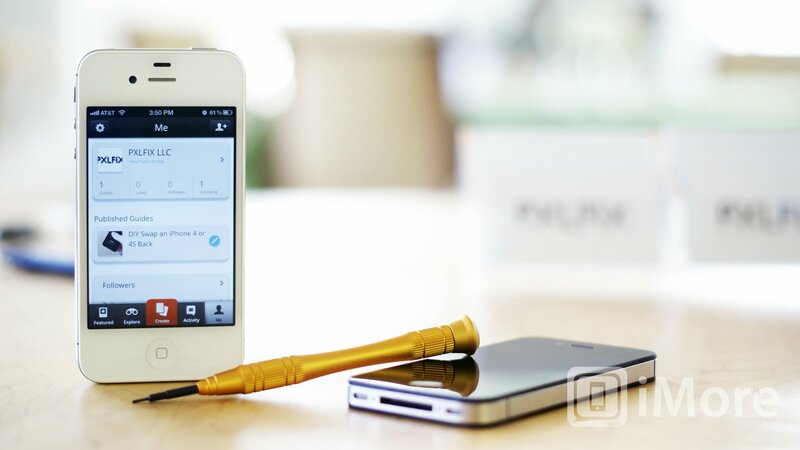 If you've got an iPhone and a spark for creativity, this is the app for you. I've already found tons of home DIY guides I want to get around to trying. If you've picked up this app, let us know if you've found or created anything particularly interesting! I've already found quite a few guides relating to iPhone, iPad, and iPod. I'm excited to contribute to that number in the near future.